Bratz Xpress Yourself! : Friends, Family, School, and You! Brazt! Xpress Yourself! : Family, Friends, School and You! Bratz Xpress Yourself! : Friends, Family, School, and You! is for Ages 4-8. Bratz Xpress Yourself! : Friends, Family, School, and You! Bratz Xpress Yourself! : Friends, Family, School, and You! was published by Grosset & Dunlap. 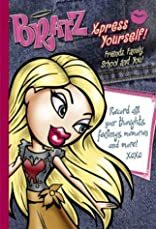 Subjects of Bratz Xpress Yourself! : Friends, Family, School, and You! include Children's 9-12 - Sociology, Children's Books/Ages 9-12 Nonfiction, Children: Grades 3-4, Interactive & activity books & packs, Juvenile Fiction, Juvenile Nonfiction / Body, Mind & Spirit, Juvenile Nonfiction / General, Juvenile Nonfiction / Social Issues / General, Novelty & Activity Books, Social Issues - General, Social Situations - General, and Toys, Dolls, & Puppets.